HRWF (15.04.2018) – The French government is trying to expel El Hadi Doudi, an imam preaching a fundamentalist form of Islam contrary to human rights. On 8 March, a Commission composed of administrative and judicial magistrates opened the way to the deportation of the controversial imam after it identified cases of hate speech in the numerous sermons of the imam. Jews are “unclean, the brothers of monkeys and pigs,” he said. Adulterers “must be punished by stoning to death or decapitation,” while women “must not leave the home without authorization.” The apostate “needs to be eliminated by the death penalty, to protect Muslims.” Most damning, the Commission report said, Imam Doudi “explicitly” justified jihad. Imam Doudi, 63 was born in Algeria and is not a French citizen. As he is very active on internet, his influence extends not only in France but also throughout Europe. His lawyer said he is the only imam authorized to issue fatwas. Over 37 years, he has often criticized Jews, women and the modern world, yet former governments have long tolerated his hard-line sermons. President Macron is adopting a tougher line, especially about hate speech. However, France had never been lax in its fight against extremism and terrorism. From 2012 to 2015, the then Interior Ministry kicked out 40 Muslim clerics, and another 52 people, including clerics, were also deported over the last 28 months. “It’s not just the terrorist organizations, the armies of Daesh, the imams of hate and death that we are fighting,” Mr. Macron said, referring to the Islamic State, in a speech last week honoring Lt. Col. Arnaud Beltrame, a police officer who died in terrorist attack at a supermarket in southern France after swapping himself with a hostage. “What we are fighting is also this subterranean Islamism, which advances through social networks, which accomplishes its task invisibly, which works silently on the weak and the unstable, betraying even those it claims to represent, who, on our very soil, indoctrinate through proximity and daily corrupt,” Mr. Macron said. Marseille – France’s second-largest city, one-fifth Muslim – is not especially radicalized. Other cities in the south of France, like Nice, have had higher numbers of young people leave to fight in Syria, and greater proportion of Muslim residents on the government’s terrorism watchlist. However, almost all of the fines in Marseille for wearing a face-covering, head-to-toe veil – which is illegal in France – have been imposed in the vicinity of Imam Doudi’s mosque, the police say. The authorities are growing increasingly concerned about the potential for radicalization – especially since two young women were killed in a knife attack at the city’s main train station in October. The Sounna mosque where Imam Doudi preached, on the Boulevard National in the Third Arrondissement of Marseille, was closed by officials in December on the grounds that his sermons could “provoke acts of terrorism.” Five members of Imam Doudi’s flock left to fight jihad in Syria, according to the police. 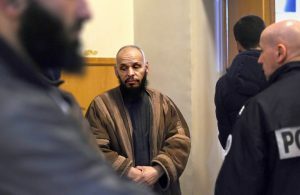 His sermons are “exactly contrary to the values of the Republic,” said Marseille’s prefect of police, Olivier de Mazières, a terrorism specialist who has led the case against the cleric.